Historical films embody an enchanting aura. They bring our past to life and rejuvenate significant milestones in history. They uncover the ambiguity behind certain events and are like a window to an era shrouded by grandeur and mystery. Sanath Abeysekara is known to dwell on such topics with panache and style. 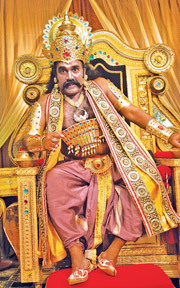 His maiden movie ‘Mahindagamanaya’ brought a record number of audiences back into theatres. ‘Siridaladagamanaya’, his second cinematic venture, too rotates around another hallmark in Sri Lankan history. 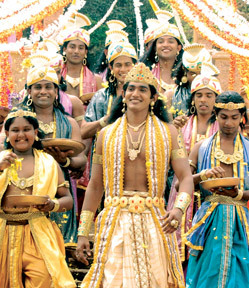 A star studded cast comprising Jewan Kumaranathunga, Geetha Kumarasinghe, Dilhani Ashokamala, Sriyantha Mendis, Hesan Manjula, Prasadi Smarakoon, Madumadawa Aravinda, Gayan Wickramathilaka, Anusha Damayanthi, Piumi Botheju, Chinthaka Kulathunga and many others take part in the film. The movie has completed shooting and is due to be screened in May 2013. Q: Is ‘Siridaladagamanaya’ the sequel to ‘Mahindagamanaya’? A: The main theme in both films is the growth of Buddhism in Sri Lanka. The first step of this venture was brining the Sri Maha Bodhi to the country and that was projected in ‘Mahindagamanaya’. Later the Buddha’s left canine tooth was brought to the country. This has a major impact on the popularization of Buddhism. Therefore there is a link between the two films. Since the only two tooth relics of the Buddha existing in the world are in Sri Lanka: one in the Temple of the Tooth Relic in Kandy and the other in Somawathi Stupa, it creates a similar aura to having the Buddha living among us. It is believed that the other two tooth relics of the Buddha are in the Naga World and in the heavenly domain of the king of gods, Sakra. There is much confusion on how exactly the tooth relic was brought to our country and where the other tooth relics exist. Some even think one is hidden in China but there is no concrete evidence to support this theory. I did a lot of research using the Mahavamsa and Dhatavamsa and presented my discoveries to Ven Ellawala Medhananda Thera and discussed with him before making the movie. We want to reveal true details regarding these sacred tooth relics to the world. Q: Though they brought the Buddha’s tooth relic to Sri Lanka and had to endure many hardships in the process, Princess Hemamala and Prince Dantha’s roles are not given due credit in history. Does ‘Siridaladagamanaya’ fill this void? A: Certainly. They both played pivotal roles in bringing the tooth relic to our country. There are several scenes in the film which depict how they were ready to sacrifice their lives to save their prize. History records that in one instance Princess Hemamala and Prince Dantha climbed onto a huge rock while being chased by enemies. The opponents circled the rock but the prince and princess jumped off the peak. At that moment a giant eagle swept down from the sky and took the couple to safety. They met an Arahat on the way and caught a boat from Tamralipti port and sailed to Sri Lanka. Apart from humans they had to face invasions from supernatural beings like the Nagas as well because they wanted to steal the tooth relic and take it to their world. There too they were able to defeat these forces by the blessings and divine powers bestowed on them by the tooth relic. Q: You have employed two new faces for the two lead roles in ‘Siridaladagamanaya’. A: One of the challenges I had to face was to locate two individuals who have similar physical appearances to Princess Hemamala and Prince Dantha. There is a globally renowned portrait of them and their appearance has been etched in our mind according to that image. Even Ven Ellawala Medhananda Thera, the Maha Sangha and our sponsors, Ven Akaravita Sangananda Thera and EAP Chairperson Dr Soma Edirisinghe requested me to pay specific attention to this fact. We even decided not to do the movie if we cannot find two people to suit these roles. Our Executive Producer Nihal Sanjaya presented a lot of youth to me and we finally came upon Prasadi Smarakoon whom we saw in one of Iraj’s video visuals. Heshan Manjula was selected out of around 300 who took part in our auditions. The Maha Sangha advised me to select two artistes who refrain from eating meat, who observe the five precepts, listen to Bana and live according to Buddhist teachings. Prasadi and Heshan pledged that they will follow these vows in front of the Maha Sangha, the Ruwanweli Seya and the Temple of the Tooth Relic and received their blessings before embarking on this venture. Though many veteran artistes and business magnets tried to persuade me to take their children for the roles we stood by our decisions because we took them on behalf of Buddhism and the country rather than for our own gain. This is a big budget movie and my producers were very supportive and made sure that things ran smoothly for me. Therefore I was able to put in my best efforts in directing the movie. 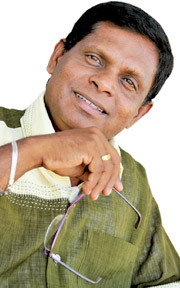 Q: After nearly a decade Geetha Kumarasinghe returns to the screen. A: Geetha returns to acting after seven years. I had difficulty in convincing her to make a comeback but after we explained the role to her, she agreed to give life the character. She acts as Queen Brahmadatta. Since her generation is from the Brahmin religion, the queen observed Buddhism in secrecy. Q: ‘Mahindagamanaya’ deals with one era in history. ‘Siridaladagamanaya’ unfolds several decades later. How did you distinguish the two eras in the films? A: Around 90 percent of ‘Siridaladagamanaya’ is based in India while most of the scenes in ‘Mahindagamanaya’ unfold in ancient Sri Lanka. Shooting for ‘Siridaladagamanaya’ took place near Katukaliyawa Wewa in Mihintale. We constructed the biggest palace made for a movie in Sri Lankan cinema history. We also made a replica of the Temple of the Tooth in India. Before embarking on this project I spent several months in India exploring the areas where these kings had ruled. Therefore I have not only read about the subject but I am an eye witness to some of these details. Q: Some argue that you stick to the facts and that your creations take more of a form of a documentary than an art creation. They say that your productions do not compel the viewers to think further on aspects linked with the topic. A: That is not my aim in film-making. People have various ideologies regarding cinema however a cinematic creation should entertain and develop the thinking patterns of the spectators. Masses have watched my debut movie because I have identified their needs as a film-maker. We do not have to burden them with mind-boggling aspects to ponder over. They hardly have time to read about these details from books. The only thing we can do is to use arts for a fruitful gain like projecting the importance of our history to the society. hrough this there are many things for them to think over if they wish to dig deeper into the subject. Veteran journalist and film critic Sunil Mihindukula launched his latest book ‘Picture Pissa’ (Film Buff) on July 25 at Lake House. Media Centre for National Security Director General Lakshman Hulugalle participated was the Chief Guest while Jackson Anthony delivered the keynote address. “My greatest treasures are my books and it is my personal and professional pride. I wish to thank Lake House for lifting me up and making me what I am today. And I want to give back to Lake House. In this collection of books are some of the rarest books in Sri Lanka that cannot be found anywhere in the country. These books are extremely precious to me. I wrote a book called ‘Cinema Prekshanaya Saha Rasasvadhanaya’. The copies of this book are in the possession of just one or two people. Now this book is out of print,” said Mihindukula who had authored around 20 books on cinema. In a token of appreciation Mihindukula has donated some books to Lake House as a mark of his appreciation. These books cannot be given outside but circulated within Lake House. Now Mihindukula is the editor of ‘Rasadhuna’. He has worked for ‘Sarasaviya’, ‘Dinamina’ and ‘Silumina’. ‘Picture Pissa’ is a collection of his experiences. “It is a great thing a very great thing. And it is a good example for others. Mihindukula is a good writer and a very humble person. 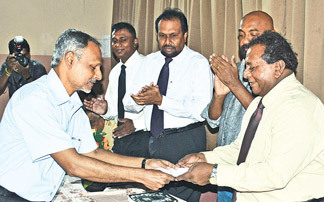 The book is very important,” said Editorial Director Seelaratna Senarath. Even as Deepika Padukone’s latest film ‘Cocktail’ has garnered positive reviews for its music and look, the actress says she is not bothered about box office results. “This film is very special to me. Personally it has been a journey for me as an actor as I have invested in this film physically, mentally and emotionally. I want people to enjoy and feel for the film as I do. I am not concerned about box office, I don’t care how much money it earns,” Deepika told reporters regarding the movie which is now screening at Liberty cinema. The Homi Adajania-directed romantic comedy ‘Cocktail’ stars Saif Ali Khan, Deepika Padukone and debutante Diana Penty, besides Dimple Kapadia and Boman Irani. “For me money does not matter. I want people to enjoy the film. Critics and people enjoy it, in that case if the film earns money then its good,” she said. ‘Cocktail’ is a story of three friends: Gautam (Saif), a flirt, Meera (Diana), a girl with desi values, and Veronica (Deepika) who is a bold and outspoken. The film is about how the friendship becomes confusing and love gets complicated. “The film is a journey of three friends of different personalities and then how love happens is a cocktail,” Deepika said. Deepika was offered both the roles of Meera and Veronica but she chose to play the latter. “This role was most challenging as I have come out of my comfort zone. I have taken a risk. When Dinesh Vijan (producer) asked me to pick up a role out of the two - Meera or Veronica I thought I have already done something like Meera in ‘Love Aaj Kal’ so why to repeat same thing, hence I chose Veronica. To play Meera would be similar and Veronica is new and challenging,” she said. A Japanese film festival will be held at the E O E Pereira Theatre (Engineering Faculty) Peradeniya University, on August 17 and 18 to mark the 60th anniversary of diplomatic relations between Japan and Sri Lanka. It is being jointly organized by the Embassy of Japan and the Engineering Faculty, Peradeniya University. * August 17 at 6.00 pm - ‘Wanko’ - The story of me, my family and my dog. * August 18 at 10 am - ‘Fukushima Hula Girls’ - The location of this film is situated in the aftermath of the Great East Japan Earthquake and Tsunami of 2011. * August 18 at 2.30 pm - ‘Quartet’ - This musical film celebrates the story of a family reunited by their love for classical music than for kinship. Admission to view these films is free of charge to the general public and seat allocations will be on a first-come first-served basis.